Blondin (born Jean François Gravelet, 1824 – 1897) was a French acrobat and tightrope walker. He started performing as a young boy. In 1855, he came to the United States and is best known for crossing the Niagara Gorge on several times. 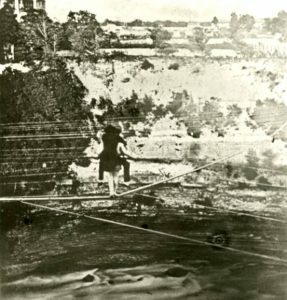 The Niagara river was crossed on a tight rope on the 30th ult., by M. Blondin, with as much or more ease than a lay man would manifest in walking across a smooth road. He walked part of the way across and then layed [sic] down upon his back for a minute, he then started again and when to the middle of the rope, stopped – let down a cord to the Maid of the Mist which was on the water under him and drew from it a bottle of liquor which he drank from, after which he proceeded [sic] . . . and reached the Canada shore in a short time. He . . . accomplish[ed] the return trip in about ten minutes. . . .
MONS. 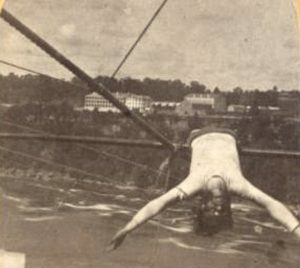 BLONDIN, has again crossed the Niagara River. . . . When near the center of the rope, he stopped and held aloft his hat, through which Capt. Travis from the Maid of the Mist, shot a rifle ball. He walked backwards and crossed in fifteen minutes . . . On his return he wheeled before him a wheelbarrow. At various times Blondin made the crossing blindfolded, in a sack, on stilts, carrying his manager, pausing midway to cook and eat an omelette, and standing on a chair balanced on one leg on the rope. On August 10, the Courier said, he stood on his head in the middle of the crossing, and performed some one-handed gymnastics off the cable, to the astonishment and terror of several thousand spectators. Daily Gazette, August 24, 1860: “Rope Walking in Geneva. F. M. Slingerland, a skilful [sic] rope walker, announces some extraordinary feats in that line in this village on Saturday Sept. 1st. If he performs all he advertises, he will throw Blondin far in the shade.” I found no review of this performance. 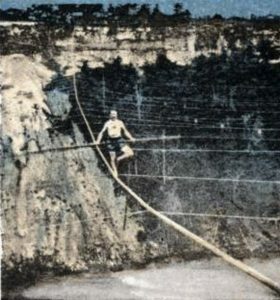 Daily Gazette, August 27, 1886: Circus owner “Forepaugh’s horse Blondin will attempt to cross the Niagara chasm on a tight rope . . .” Mercifully, this was apparently called off. This will be Blondin’s only appearance in Western New York State this season. The performances of the famous tight rope walker will be free to the public, and very low rate excursions have been arranged over the New York Central & Hudson River Railroad. . . . although sixty-four years of age, [Blondin] is still nimble as a cat on the tight rope. Among the notable features of the performance, is the carrying on his back of his son or any other person willing to take the risk across the rope . . . He walks the rope and goes through various evolutions blindfolded and in a bag, balances on a chair, and performs tricks that would be difficult for an ordinary person to attempt on the ground. . . .